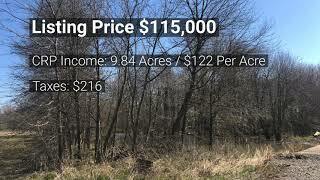 Great opportunity to purchase a small recreational tract with income. This property is located a quarter of a mile west of the Edwards County line on Co Rd 1100 North / Co Rd 2900 East. The CRP contract is active through 2029 for 9.84 acres. Along with the CRP, 3 small fields make the perfect spot for food plots. There is some tiling on the cropland. Give me a call for more information. This listing won't be available for long! Directions: Heading west from Albion IL on East Main Street/IL-15, turn right onto Massilon Road/Co Hwy-8. In 3.08 miles turn left onto Co Rd 1100 N for about 1.6 miles.